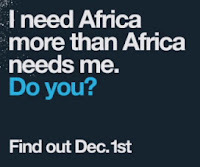 I was recently asked by Mocha Club to take part in a project that they have coming up on December 1, 2008 called, "I Need Africa More Than Africa Needs Me". My first thought was, "Really? I'm not sure what that means." Then, I remembered. There was a time when I was sure I would be heading to another country as a missionary after I was finished with college. I had heard from so many of my peers who had traveled around the world how horrifying the poverty was in Africa, in particular. They would go hoping to change the world one village at a time. They would return completely changed instead. Though I was willing in those days to go and try to make a difference with people living in poverty, I was never called to go. Fast forward about twelve years and I'm pretty comfortable in my own bubble here at home. I'm reading about a group of bloggers traveling to Africa with Compassion International and I read every word they shared about their experiences. Through their experiences, my heart was changed and reminiscent about the experiences I was sure I'd one day have. I haven't been able to get my mind off the pictures that were shared and the stories that were brought back. There are times when I've asked myself the tough questions about my willingness to step so far out of my comfort zone to help people who define poverty in a way that I can't even fathom. If I'm being completely honest, most of the time the answer is a sad testament of my own selfishness. This glance into my own heart in recent weeks has shown me that the statement, "I need Africa more than Africa needs me" is so very true. I need a willing heart. I need a desire to serve others. I need to see that the world is bigger than what I can see on a daily basis. I need to understand that the love of God only extend to those in my house, on my street, at my church or in my country. I need Africa. I invite you to share what this statement means to you. Do you even agree that it's true? I'll be back with more details about this project on December 1 and I hope you'll join me. I pray that you won't be able to get this statement out of your mind until then.